Twelve days before Christmas and I am now in a panic. I have all my cookies to make before I start cooking my food. Today is the day I start. I make about six different cookies that are mostly my Moms recipes. I have tasted a lot of cookies and she has the best. The secret is BUTTER. Real butter not anything else. Today I am going to make all the dough and put them in plastic bags in the refrigerator. This really saves a lot of time because all the mess is made at once. Then I roll two or three cookies every night. I will be making thumbprint, butterballs, apricot crescents, shortbread dipped in chocolate, pizzelles, wine and pepper biscuits plus my good friend Maria’s greek cookies. The greek cookies are my favorite but I would have to make a video to show you how to make them. Today is the melt in your mouth shortbread. You must use butter . 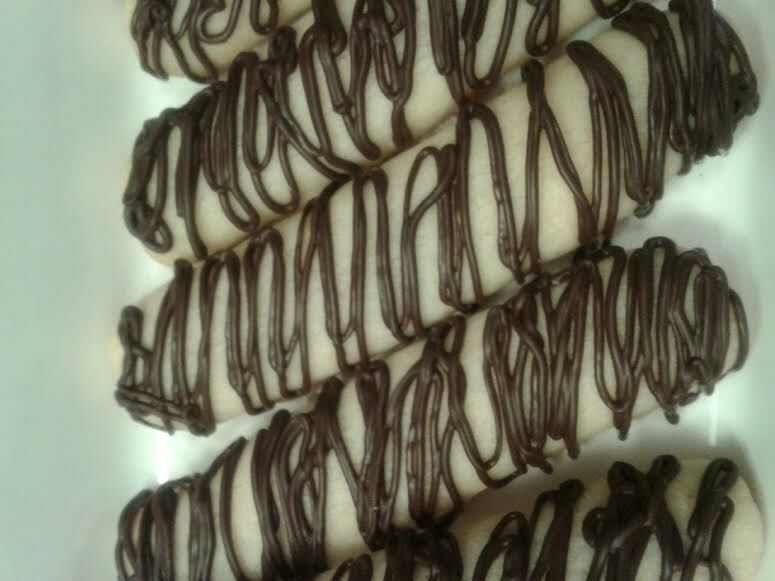 When they are cool, drizzle or dip in melted chocolate. These have to be stored in an air tight container in a cool place.